Students receive one lesson per week. Lesson lengths: 30, 45 or 60 minutes. Lesson lengths vary according to each student’s age and skill level. Please contact me about rates. According to schedule openings, both morning and afternoon lessons times are available, including weekends. Payment for the full number of lessons per month is due at the first lesson of each month. Lessons focus on development of solo repertoire, but include time for orchestra or chamber music repertoire as well. For support, I demonstrate style and technique, playing my own instrument. I also accompany solo works, playing a harmonized second part. 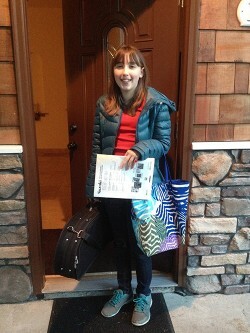 Students are required to bring their instrument, a shoulder rest, and the assigned sheet music to each lesson. Lessons must be accompanied by individual practice at home. This will allow for steady progress in skill, self-confidence, and fun! Two student recitals per year: Fall and Spring. 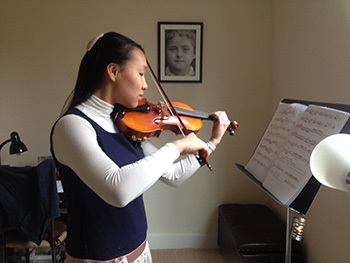 Eva Lu performs her piece at her lesson. I would just like you to know how appreciative I am to have had you as my violin teacher. I feel you have taught me so much. Not only have I become a better violinist, but thanks to you, I have grown in my confidence. When I first came to you for lessons, I was about to quit violin. But you taught me how to find my inner voice and to see the beauty in playing music. Abigail Reed arrives at her lesson.